This is a long post. My apologies. (I haven’t actually covered even half of the hot mess that was the March 3rd meeting, however.) If you have watched the last board meeting, much of this should be obvious to you. So if you wish to skip the summary section, please feel free to do so. The most interesting, and I believe least obvious material, starts at the heading “How to Address the Student Discipline Issues” below. On Thursday, March 3rd, Dr. Wardynski offered an hour long presentation on “Student Conduct.” If you wish to download the presentation, you may certainly do so, but as you see below, Dr. Wardynski did not spend much time developing slides for this presentation. If you prefer watching the meeting, you may do so here. The discussion of the Student Conduct agenda item begins at about the 1:12 minute mark. This isn’t different from the new procedure that he posted on Saturday, February 27th. There wasn’t much time spent explaining this new procedure to the board of education (nor seeking their approval of it), but he did offer a significant amount of information concerning his implementation of this procedure. You can read a transcription of their discussion here, but I will offer a summary of it below. I’m not certain where the superintendent is drawing his numbers from, but according to the Alabama State Department of Education, the Average Daily Membership (ADM) at Huntsville High has increased from 1,720 in 2011-2012 to 1,940 in 2015-2016 which is a 12% increase in enrollment rather than a 25% increase that he was claiming. Since his student enrollment growth estimates were basically twice the reported level, unless and until Dr. Wardynski releases hard data supporting his claim that fights at Huntsville High have decreased by 20%, there’s no reason to believe him when he claims that they have. Wardynski often seems to have issues getting the numbers correct. Uh, given guidance to our principals, as we brought in the new technologies that identify who precipitated a fight, they’re out. And if you’re just defending yourself, and you stop fighting when the adults say, “Stop Fighting,” and get in, break it up. Then no consequence. You were defending yourself. If you don’t stop fighting, there will be a consequence. Did you notice how imprecise and ill-defended the consequences for precipitating a fight are? If not, not to worry. That really wasn’t his point at that moment. Instead he was trying to justify the purchase of $400,000 worth of “high-def cameras for HHS over the summer. While he claimed that a student starting a fight would be “out,” this is not true according to the 2015 Code of Conduct. As you can see, many of the infractions that involve Fighting have been moved to Class I violations requiring that the teacher deal with the issue in class. Mutual participation in a fight involving physical violence where there are at least two participants, but no one main offender and no major injury. Fighting does not include verbal confrontations, tussles, or other minor confrontations. This conduct creates a substantial risk of serious physical injury to another person. Administrators need to consider age and developmentally appropriate behavior before using this category. See also Assault, Harassment, and/or other applicable terms. The district no longer has a Class III fight where the fight would be considered severe enough to warrant expulsion immediately. So Dr. Wardynski’s claim that students who fight, “they’re out,” is not supported by the Code of Conduct nor by practice. Students who fight are typically not expelled from school for doing so. This is not the case with students who record the fights, however. But we’ve caught kids distributing (fight videos) using SnapChat, and we have expelled them. And we will continue to expel them. They’re destroying the value of the schools. They’re bringing threats into the schools. They’re disrupting education. And they’re destroying the property value for homeowners who don’t even have kids in the schools. Based on the amount of time he spend discussing the recording of fights as compared with the amount of time he spent discussing the actual fighting issue, it would seem the superintendent is more concerned about property values than he is about stopping fights in our schools. We will expel children for violating Board Policy, which I think is 6.6, J.R.? Uh, 6.2 or 6.6. And then Code of Conduct 1.19, Code of Conduct 3.25. And we have expelled children. And we will expel children for that. It has nothing to do with covering things up. We report our fights. We record our fights. We report them to the federal government. The board policy to which Dr. Wardynski is possibly referring is 6.22 which is the only policy that references Video Recording. 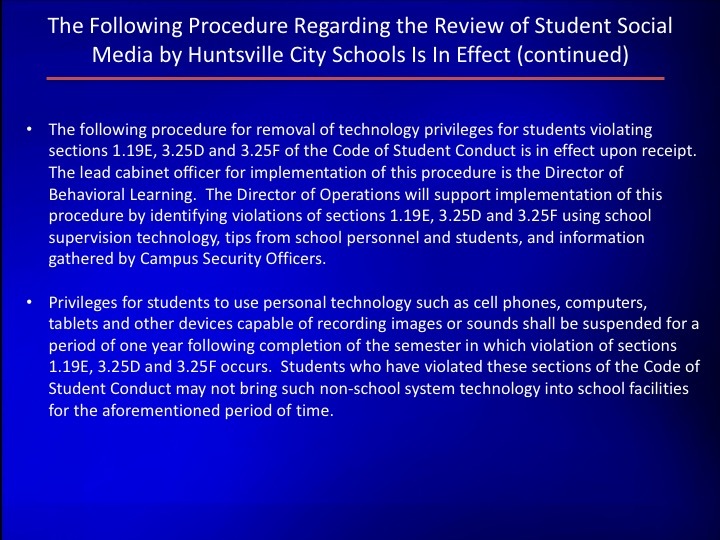 This policy prohibits the “Use or visible possession of any such device (cell phones) during school hours . . . except by permission of the Principal.” As Wardynski himself later points out, he has been the superintendent that has allowed students to bring cell phones to school and that has allowed them to be used in class at school as well. So his intention here is use a board policy that he has openly ignored for years as justification for punishing students for using their cell phones in ways he does not approve of. His appeal to the board policy that he’s openly ignored for years is rather hypocritical, no? Well if that’s not enough, how about the fact that many several students over the past two weeks who have been threatened with expulsion have not been expelled once their parents hired a lawyer? The primary purpose of the Consent Agreement that has, according to Wardynski, forced the district to reevaluate the Code of Conduct, is to ensure that students will be treated fairly and equitably across the district regardless of where they attend school. However, it seems that one of the side effects here is that students’ with parents wealthy enough to hire legal counsel will indeed still be treated differently in this district. Uh, our police force is really not there for fights. Our police force is there to protect our kids from threats that may come into the school, typically in the form of an adult. Or a child who has a weapon or something. The police will intervene, though, where they deem effective, where they deem it’s their job to intervene. Perhaps by way of explaining why so few of the incidents reported on the Student Incident Report resulted in a police referral (In 2015, there were 3,175 incidents reported to the state. 23 of those were also referred to the Police. None of those referrals were for fighting. ), Wardynski offered an extended defense of why he doesn’t want the police handling fights on campuses. So, would it look like. Well, if the police were involved with dealing with fights, which they don’t seek to do, and we don’t seek for them to do, but they can become involved in and if they think it’s appropriate, um, you’ve now got disorderly conduct. You’re going to probably be taken to somewhere to be interviewed by the police. You’re probably going to be searched. If you’ve got a reefer on you. Now you’ve got a reefer. If you’ve got a pen knife, now you’ve got a knife. If the police hadn’t been involved, none of that secondary information would’ve come to the fore. Now you’re on your way home, and you run a traffic light. We’ll you’ve already got three things. Now we’ve got a traffic stop. Now you’re probably going to be addressed differently. Wardynski seems completely at ease with students possessing “reefer” (as did McCaulley judging by her laughing at this) and “a knife” on campus. What he isn’t at ease with is the involvement of the police in addressing such possessions. It has been an ongoing joke this year that the safest place in the city limits to be in possession of marijuana is on a Huntsville City Schools campus. It would seem that Wardynski agrees with this. In 2014, Dr. Wardynski initiated (again without board approval) the SAFe Program by hiring a former FBI agent named Chris McRae though the T&W Operations company here in Huntsville to supposedly monitor social media for threats that were coming from students. As I wrote back then, I was convinced that the primary motivation for Wardynski’s interest in social media had nothing to do with protecting students from other students and everything to do with Wardynski wishing to know who in the city was speaking ill of him and his policies. I have yet to understand why any parent would believe that having the school system monitoring their child’s social media pages would be a good idea, but evidently there are some that do. (Yet another reason I cannot support the PTA in this town.) I would prefer that the district spend their time, energy, and money addressing the fighting that is happening in schools rather than the posting of the fights on social media. After all, if you address the fights, then the posting of the fights is moot. 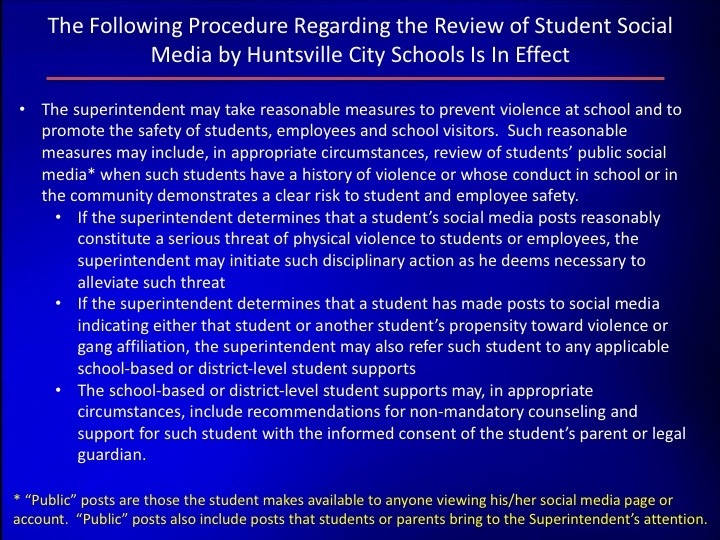 Wardynski: Uh, the other thing that we had, we had a teacher at Huntsville high, for reasons I couldn’t figure out, who spread rumors, even on social media, uh that these kids who were in a fight, which were kicking around on the floor a cell phone, were king around a gun. Well if there’s a gun at school, we know. While I’m fairly certain that Wardynski might know after the fact that there was a gun at school, I’m not certain how he would knowthat in the heat of the moment. Either way, it’s clear that Wardynski believes that one of the benefits of this social media spying program is so that he can keep track of what teachers are saying and posting on social media. I have been told that teachers across the district are being warned by their principals that not only will the district use the cameras to watch students, but they are also using them to watch teachers and what they are doing. Wardynski: We’ve got a teacher at Hampton Cove Middle School who’s passing around fight videos on social media. Why she would do that, I have no idea. It undermines the value of the community, the school, it undermines confidence in the school system. If a teacher is going to put their name on something and send it around, people are going to think that it’s true. And that there’s some, and that this person is in possession of all the facts. Teachers do that, I think, frankly are way below the level of professional ethics. And uh, they need to stop it. As it will help us come to a resolution of this matter, let’s see if we can answer the question that Wardynski asks of why would a teacher record a fight and/or share a fight video that was recorded on their own personal social media site? Why Teachers Might Share a Fight Video? Dr. Wardynski’s constant refrain in the public is that everything is awesome. Students are learning more than ever. Teachers are happier than ever before. The school system is growing faster than ever. And Wardynski is the reason for all of this awesomeness. It would seem that Mr. Ward and Dr. Wardynski are of the opinion that “everybody else is doing it” is an effective argument to use to get you out of trouble. Pity they’re still operating on such a childish level. Teachers share videos because, like any human being, they want people to believe them when they say how they are often afraid to go to work. It really is as simple as that. The primary thing that Wardynski failed to do during his hour long speech was to actually offer any solution to the problems that we’re facing. Stopping the recording of a fight is not going to stop the fights. Huntsville High proved that on Monday, March 7th when before 10am a student who had been punished for fighting the previous week returned to school, announced her intention to receive suspension again, and proceeded to get into another fight. The screams of teachers and other adults that students must leave their phones in their pockets had no effect whatsoever on the fight. So, what could have an effect on the fights? We begin to get a picture of where the discipline issues are coming from in three questions from Ms. McCaulley. McCaulley: What I was gonna explain to those individuals cause I received a call from news media, would the board be voting on these procedures. The board develop policies, and we may give the superintendent directives something like, “We want safe schools.” How is administrative. The board does, we do not develop procedure, we just set policy. I use the example that we may say we want lights in every room. We don’t tell ‘em what kind of lightbulbs to use, we just say lights must be in every room. So that, they were asking why we did not vote on these procedures, that is not the role of the board. And if you can check statute and the constitution of Alabama, it may help you some to understand the role of the board. We are governance, we are not administrative. If McCaulley can claim (no matter how unconvincingly) that the board has no role in maintaining a safe environment for students, then she can hope that she won’t be held responsible for their failure to maintain a safe environment for students. As I read the state code, and it would seem, as Wardynski and Brooks read the state code, McCaulley is wrong. But what can the board do to help keep students safe, you ask? Well that’s simple: As the elected representatives of parents and the community, they can require Wardynski to do more than just try and hide the fighting problem that he has created by expelling anyone who records a fight. They can, in other words, do their damn job. This seems like a straight forward question, no? You would think that a board member, just like a teacher would have long since had a clear understanding of what the teacher’s actions should be in the event of a fight. Well, teachers are part of the supervision system, and so first they’re supposed to help break it up. They’re certainly supposed to alert campus security, and uh, the other thing they’re supposed to do is supervise the students in the hallways. . . . They need to supervise the kids. If there’s a fight, they need to involve themselves in ending that fight. Uh, alerting campus security. And probably the last thing that they need to do is passing around videos of fights. You’ll notice he seemed to be developing this procedure for how a teacher should address fighting in the schools on the fly. If you don’t, then you can pick up on it from Mr. Brooks’ interjection that teachers are only required to provide “Reasonable Supervision,” which did not enter Wardynski’s answer at all. You see, as any reasonable person already knows, having a 120 pound 25-year-old teacher “involve themselves in ending that fight” between two 18-year-old male (or female) students is a recipe for disaster. It’s a pity the superintendent isn’t reasonable. You read that correctly, it doesn’t exist. Teachers have neither been told what they are expected to do, nor how they are expected to do it when it comes to their observing and ending a fight. The teachers have restraint training, and we continue to provide that. Now the restrain training is primarily oriented on in situations where you have behavioral problems already; special ed and so forth. Yes, special education teachers and aide do have some restraint training for protecting a special education student who is in danger of harming himself or others. The number of people who have received this training is likely less than about 100 people district-wide. Wouldn’t a reasonable person’s first response to videos showing fights across the district have been to ensure that teachers knew exactly what was expected of them? Wouldn’t a reasonable person’s second response to videos showing fights across the district have been to ensure that teachers had the training to do exactly what was expected of them? Wardynski’s first response: outlaw the recording of fights, which is frankly not the act of a reasonable person, but instead the act of a person who is only concerned about a possible decline in property values rather than a concern about students? So why would he do this? Why not just put the procedures in writing? Wouldn’t an email be a far more efficient use of his and “key members of the cabinet’s” time as opposed to going out and meeting everyone? The reason he doesn’t want to put the procedures is writing is that he wants to be able to blame teachers for the fights and use their approach to dealing with fighting against them during their review period. If you don’t tell someone what they are responsible for, it’s much easier to blame them for not doing it after the fact. His refusal to put his expectations in writing is driven by his motivation to punish teachers for how they handle discipline issues without explaining to them how they should actually handle it. Mr. Hicks? Since I have you here this evening, would you please clear up this rumor that’s going around that teachers have to be cussed out five times before they can do something? Uh, that’s absolutely false. I talk about that several times because I hear the rumors myself. And every time I go to a school, I tell the teachers that that is not the case. We don’t expect them to be, uh dressed up and down, without uh having some kind of consequences or some kind of response. What we’re gonna do is go out to the high schools, principals, administrators in the feeder pattern, so that elementary, middle, and highs, and the lead teachers from elementaries, middles, and highs. I’m going. I’m going with key members of the cabinet. And we’re going to hear these kind of issues. We’re gonna have the superintendent tell them, “Nope, you don’t have to do that. The Code of Conduct says here’s the consequence for students misbehaving in that way. And here’s the things you can do about, so I don’t have to listen to these rumors anymore about what teachers can and cannot do. Don’t you just love it when bullies start talking tough? Since Dr. Wardynski suggested that teachers should refer to The Code of Conduct, let’s do that. What does the Code of Conduct tell teachers about handling and responding to the use of profanity in the classroom? First time violators for elementary and high school are subject to “in-class corrections and conference with the student. Parents may be contacted.” There is no mention of sending the child to the office. Thus the Code of Conduct requires that a student not be sent to the office for cussing a teacher out once. 2.38: Habitual Disrespect/Profanity: Weekly occurrences over a two month period of incidents of profane or obscene language (verbal, written, or any gesture). Thus, after weekly cussing over a two month period, a student may receive in-school disciplinary action if the teacher has clearly and repeatedly documented the actions of the child. So it would seem that Wardynski is right. It is a “rumor” that teachers don’t have to be cussed out five times before they can do something about it. The reality is that a teacher must be cussed out at least weekly over a two month period before they can do something about it. And then, only if the teacher’s paperwork is completely in order. What are the Causes for the Rise in Student Discipline Issues? The causes, after listening to the board and superintendent, and reading the Code of Conduct seem fairly clear. The Code of Conduct clearly reduces the allowed punishments for violations. Teachers are putting their jobs in danger if they refer a student to the office. Teachers do not have a clear procedure they feel safe to follow to address behavioral issues like fighting. When students are referred to the office, since principals do not wish to risk the wrath of Wardynski in a negative data meeting, students are returned to the classroom to disrupt the class further. Students absolutely know that teachers do not have the support of their principals nor the respect of their superintendent. As such, they do not respect their teachers. Dr. Wardynski is clearly more concerned about maintaining his reputation than actually addressing the fights that are occurring. Thus the fights continue. It is well past time for this superintendent who “doesn’t want to listen to these rumors” of his own creation to leave this district. It’s possible that we might manage to survive if he does so soon. If he’s still here at the end of the school year, we will see yet another mass exodus of teachers that makes us long for the exodus we saw last summer. And we’ll see a mass exodus of students as well. I am really concerned about what is going on in the middle schools or “junior high schools” (what is with the name change?). I don’t think that fighting or “insubordination” should be handled the same way that it is in high school. From what I hear, problem students are either not dealt with at all or are dealt with too harshly. There doesn’t seem to be a standard policy. I agree. The Code of Conduct is a mess. I am ashamed and embarrassed by the lack of true leadership in the Huntsville School system. It has truly gone downhill. I don’t care if I’m politically incorrect, but I’ll tell you the problem. When you allow anyone to register in a school regardless of what school they are zoned for, then you can expect this to happen. When anyone with kids relocates to a community, the FIRST think they look at is the school system that provides a safe and high level of learning. If you are provided the privilege of being able to transfer to a school in a “better” community, than you damn well better respect that privilege and take advantage of the opportunity. Basically, you’re on probation. The first time you screw up, get in a fight, be overly disruptive, whatever, you’re OUT. With regard to the “failing” schools in some neighborhoods….why are we opting to get kids out of there and overcrowd other schools that are meant to serve the neighborhood they are in? Why don’t we address the problems of the failing school? Is it structurally falling apart? Then replace it. Are the teachers bad? Then replace them and pay them more to ensure better teachers. I’m all for providing opportunity to kids, any kids, who have a desire to better themselves. But if they are going to bring their attitude and their disrespect with them to their new school, then they should be sent back to where they came from. I can’t tell you how many times my kids came home from Hampton Cove Middle school upset that they had witnessed fights in the hallway. When I asked if they knew the kids, they would just say, “No, dad, they’re not from this area.” Enough said. Thank you for writing this. This is the truth that needs to be shouted from the rooftops so everyone who lives in an HCS district knows what’s going on whether they have children in school or not. Wardynski and all of his cronies need to go! This is the most pitiful excuse for a superintendent and a school board that has ever existed. If this continues, Huntsville will truly get a bad reputation and it will negatively affect all of us. What a shame! If you don’t admit the problem, then you’ll never solve the problem. The board needs to get involved and do their job. I’m concerned that none of the other board members made any comment. I do know that some teachers know the “non-airway restrictive” take down/holds, and they do use them almost daily. Then there are some teachers that just watch horrified not knowing what to do (or perhaps afraid). I don’t think the teachers should be “jail keepers”, but they should be trained in how to handle violent situations – for their protection at a minimum, then for the protection of their students. In looking back it does seem that the special education teachers are the only ones that are trained and willing to intervene. However, I don’t think the special education students are fighting…. So much that I could comment, but it comes down to the superintendent only responds appropriately/reasonably when threatened with legal action. That says a lot. Thank you for your commitment to get the facts out there! The absolute last thing a student should do is try and break up a fight. That may be the dumbest piece of advice ever. Obviously an article and author out to discredit the superintendent at any cost. The discipline problem is complex and a difficult problem to solve and is occurring across the country, not just here. I’ve never seen anything written here about the positive things accomplished. So your motives are clear. I think many intelligent people see the good things too and see the attempts to correct this systemic problem. Sure he can come across as less than personable but Dr. Wardynski is not the brute or mad man you portray. West Point grad and teacher with a list of accomplishments and friends a mile long, loving kids of his own – all military and exemplary, he doesn’t need the job, he’s been offered many prestigious positions but he knows the job and he cares for the kids and Huntsville enough to stay even through biased assaults like this. I hope he reads this and knows the support he still has. Hooah Sir! I salute you. Stay on target for the sake of the kids, everything else is noise. Thank you for reading and for sharing your opinion. I appreciate hearing from people who disagree with me. You claim that I am “out to discredit the superintendent at any cost.” I disagree. I am attempting to be a voice for the voiceless: the teachers, the parents, and especially the students like my kids whose voices and opinions have been systematically silenced by Dr. Wardynski simply because he disagrees with them. I have not said that Dr. Wardynski was a “brute or mad man.” The only label I have offered for him of that vein over the past five years has been “bully.” I believe that his regular and persistent attacks on teachers, attacks parents who disagree with him, and his attacks on even special education kids has earned him that title. A bully is someone who attacks those who cannot fight back. I have never said anything about his military service other than thank you. I have never said anything at all about his parenting skills despite his having attacked children like my son as you can see from the post I’ve linked to above. I have said that his military experience (including his minimal adjunct teaching experience at West Point) has not prepared him for leading a school system. You claim that I am offering a “biased assault.” While I agree that I am biased (I’m not a reporter; I’m just a parent who cares about the decline in education his kids are receiving), I would ask if you could give me one single example of a time I have lied concerning anything I have posted on this site? If you believe that quoting someone is “assault,” that’s fine. You’re entitled to your opinion, but such an opinion is not based on reason. Thanks again for sharing your opinion here. Unlike Dr. Wardynski, I appreciate hearing opposing views; that is the heart and soul of what education is actually about. 1) Teachers are required to read the policy and description of restraint in a PDF via SAFESchools (I think that’s what it’s called). And yes, the PDF does primarily focus on special needs students who need to be restrained. I seem to recall there is a lot in there about how you are not allowed to keep a child strapped down or pinned in a closet or things like that. In other words, the “training” is more about how to deal humanely with special needs children who need to be kept from harming themselves. There is no real situational, practical, realistic training in this. It’s simply a few pages to read. I don’t know about you, but if I read a PDF about how to drive or play a sport and never actually practice doing it, I’m probably not going to do it right. That might be it, but if it is, it looks different to an employee who is logged in. Sorry but I failed to find word one in Safe Schools course descriptions about what a teacher should do when one kid is beating another in her classroom, especially if she is about half their combined weight. It’s amazing to me that any small people are willing to teach. Those older and smaller teachers have my greatest respect. In the real world, in detention centers and psych wards, the techs tend to be large guys. Is it even possible for a smaller person to bring down a larger one? Is it like so many personal safety classes where women leave with a false sense of security? Is it like breaking up a cat fight, which no sane person would do. But the alternative is seeing one kid possibly causing at least temporary and at worst permanent damage to another. What would be possible? Do teachers have panic buttons to summon help? Or even very strong whistles? And who will come when she gives the SOS? Perhaps there should be among the larger and stronger faculty voluntary first responders who could have the same training as psych/detention personnel. Maybe there should be a German Shepherd assigned to each class. I have heard of a partially blind teacher who brought her therapy dog, probably a German Shepherd to school every day. There were frequent fights in her colleagues’ rooms, but not in hers. And all these assistant principles — didn’t that position once have something to do with discipline? Maybe they could get out of their cushioned chairs and share hall duty — be ready if a teacher sounds the alert. Or maybe we should just ignore the problem and if a teacher complains, strongly suggest that she might like to resign rather than be fired (how many of those HCS resignations were made under duress?). Oh, and make it a crime to record anything that would suggest a day at HCS isn’t like a day at Candyland. Well said by one of HCS/HHS brightest students — the fear of reprisal leads teachers to exercise censureship of the student newspaper?? Really??? That’s a good thing to teach students, limiting their 1st amendment rights, I guess I missed that in civics class. Take a look at this excellent OP/ED by a Harvard bound HHS student !! Consider as well how often principals are absent from the building they are hired to run! It would be revealing for the system to account for all the meetings and “professional development” administrators are required/ recommended to attend off campus while classes are in session. Though there may be a TOSA present on site, the appointed and well paid administrator is absent sometimes half of the school week! Principals are 12 month employees, therefore why can’t “training” and meetings occur outside of school hours when they should be on site for students and teachers. Also, what exactly are the qualifications and training of those who cover in house learning areas considered by the system as “punishment” and redirecting those with behavior issues? Do they possess degrees in behavior modification or counseling as well as teaching or education degrees? These ILCs should be in close proximity to the principal (who should be onsite) with academic standards specified and measurable work to be evaluated by administrator each day. Are tools in place to monitor and evaluate the efficacy of ILCs and the person responsible for these rooms? Um, no. The ILCs are run by contractor employees who don’t necessarily have teaching certificates and go through no specialized training for the task. They are babysitters, placeholders, and nothing more. One of the high schools’ ILC wardens was actually arrested this year for a DUI and is already back in the classroom.